EBBA2 is the second European Breeding Bird Atlas – an ambitious project led by the European Bird Census Council (EBCC) and involving bird organisations across Europe (including BTO, BirdWatch Ireland and RSPB), to map the distribution and abundance of more than 500 species breeding in Europe. Fieldwork is being carried out 2013-17 and there are more than five thousand 50 x 50 km squares to cover. The atlas will provide up-to-date breeding distribution and relative abundance maps across the whole of Europe and importantly, will be able to show changes in species distribution since the first European Bird Atlas published in 1997. Knowing where birds occur and how distributions have changed is crucial to effective targeting of conservation policies and action. Across Europe, great coverage has already been achieved in countries with few local experts, little regular monitoring and huge accessibility challenges. Capacity-building through local workshops is inspiring and educating many new birdwatchers. In the UK and Ireland, data collected for Bird Atlas 2007-11 falls just outside the period of EBBA2 so it is important to gather as much new information as possible to ensure that British and Irish data is up to date and collected using the same grid as everywhere else in Europe. 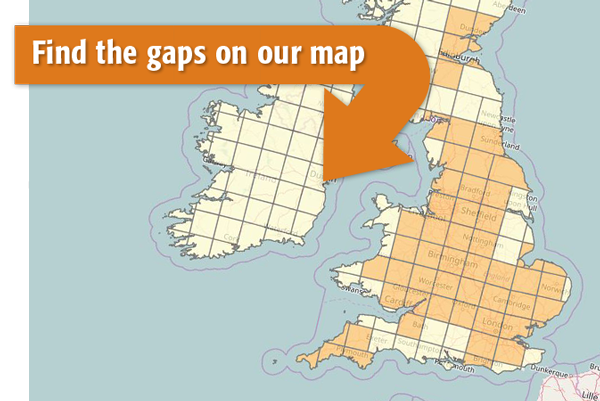 View the 50x50km grid for the UK or view the 50x50km grid for the Republic of Ireland. Log records with breeding evidence from Britain and Ireland in BirdTrack - Any record of a bird in suitable breeding habitat in the breeding season, with an appropriate breeding evidence code, can be used by EBBA2 for producing distribution maps. Records from anywhere within Britain and Ireland are encouraged, as long as the ‘site’ is within one of the 50 x 50 grid squares. Collect complete lists - Complete lists have added value for EBBA2 because they will contribute to mapping of distribution and abundance. When you go birdwatching, please make a list of all the species you positively identify by sight or sound. Record the start and end time of your visit and provide a count for each species whenever possible. Further information available at Guidance on complete lists. Enter your sightings from birdwatching trips to continental Europe - If you are visiting anywhere else in Europe in the upcoming breeding season, your bird records, along with the appropriate breeding evidence, will help fill important gaps in knowledge. View current gaps across Europe. We have already been collating UK and Irish bird records for EBBA2 since 2013. Our magnificent Bird Atlas 2007–11, which presented comprehensive distribution and relative abundance maps, was completed just before the recording period for EBBA2 started (2013–2017) so we are unable to use these records for EBBA2 (these data do provide the context for the map application). However, we are fortunate that within Britain and Ireland there are thousands of keen volunteers already participating in a broad range of surveys and schemes which generate records suitable for inclusion in EBBA2. Using information from 2013-16 from schemes that provide good evidence of breeding (such as nest recording, ringing, breeding evidence in BirdTrack) the BTO has made trial data submissions to the EBBA2 coordinating team for a suite of test species. Along with information from other countries, this has enabled the organisers of EBBA2 to test procedures and produce pilot maps. See examples of pilot species maps for EBBA2. Through our ongoing survey work and BirdTrack, we will be able to produce good data for many breeding species across Britain and Ireland. However, there are some gaps in geographical coverage, and in species recording (generally scarcer species, or those more difficult to record breeding evidence) for which we need to do some ‘gap-filling’. Records collected during 2017 will help plug gaps in coverage and upgrade the breeding evidence of species to a higher category. For each 50 km square we provide a list of species known to be breeding there five years ago, during the period of Bird Atlas 2007-11. For each species, we display the breeding status and highest level of breeding evidence that we have for 2013-16. This is based on records that provide breeding evidence extracted from ringing (pulli ringed, female with incubation patch) and nest recording (all records), and records submitted to BirdTrack with associated breeding evidence. Working with the Rare Breeding Bird Panel and the Irish Rare Breeding Bird Panel, we have also incorporated records for rare species summarised at the 50 km scale. The maps will be updated weekly during summer 2017 with new gap-filling information from BirdTrack. For the main data submission to EBBA2 at the end of summer 2017 (for all species) we will also scour many additional datasets including the Breeding Bird Survey, Waterways Breeding Bird Survey and Heronries Census for records that may plug a gap at the 50 km scale. For BBS and WBBS we can use detection codes (such as detected by song) to provide a record of possible breeding, whilst presence in suitable breeding habitat on both early and late visits may provide evidence of territorial behaviour (probable breeding). However, we need to be mindful of birds singing whilst on passage, in what seems like suitable breeding habitat but outside their breeding range. Please log your records via BirdTrack as described above. It is simple to register or login using your existing BTO username and password. It is vital for EBBA2 that you include a breeding evidence code whenever you can. Although the distribution maps for EBBA2 will be published at the 50 km scale, we ask you to create your BirdTrack sites at the smallest scale possible, whether a 1 km square or something like a small nature reserve; this will help ensure your records fit entirely with a 50 x 50 km square for mapping purposes, and increase their value for other purposes. For further information see Guidance on creating and naming sites within BirdTrack. Please select the highest (1–16) most relevant breeding evidence code from the drop-down list in BirdTrack. It is important that you apply a code only when the bird is in suitable breeding habitat. The codes used in BirdTrack are the same as those in EBBA2. For further details of the EBBA2 methodology see EBBA2 methodology (PDF). Records of rare and scarce breeding birds can be entered into BirdTrack with the assurance that they will not be displayed inappropriately. Additionally, you can mark a record as ‘sensitive’ if you feel it is particularly sensitive at a local scale. We work closely with the Rare Breeding Bird Panel and the Irish Rare Breeding Bird Panel to ensure that strict measures are applied. EBBA2 are raising funds in order to complete this huge project; to complete the final stages of data collection, to analyse the data and to produce exciting outputs for the website and the final atlas book. One inititiative is a new campaign for everyone (individuals to organisations) to sponsor your favourite species (or more than one! ).